Once you’ve installed your floors, you want to protect them in the best possible way. Daily life has wear on floors, from spills and messes to the normal wear caused by foot traffic. Epoxy coatings can help to protect your floors from these things and keep them aesthetically pleasing and functional for years to come. Epoxy coatings are composed of two parts: the actual epoxy resin as well as a curing agent. 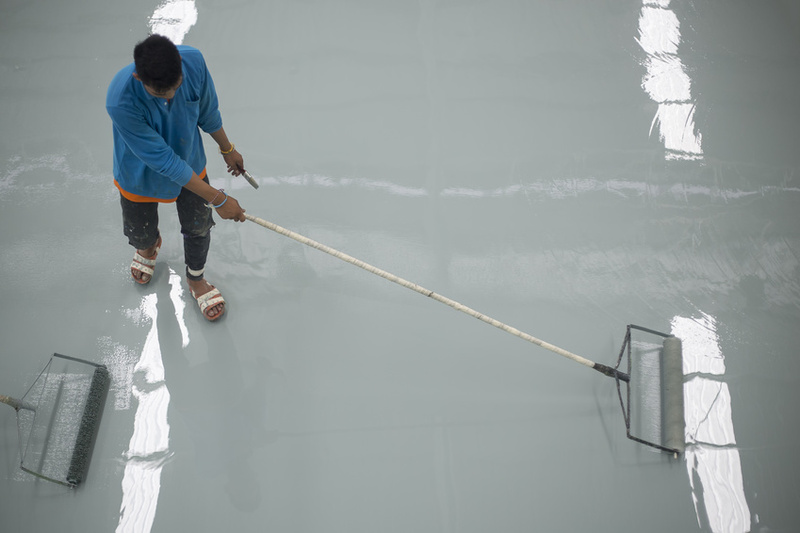 Epoxy coatings can increase the brightness of a floor by up to 200% and are incredibly durable. Epoxy coatings are resistant to chemicals and abrasions and stay on the surface of the floor well and for a long time. Out of all floor resurfacing solutions, epoxy coatings are one of the best floor solutions for the food and beverage industry. They can be used inside refrigerators and freezers and in general work spaces, providing long lasting ground coverage that is resistant to wear and tear and stands up against whatever is spilled on it, be it a chemical cleaning solution or food. Epoxy coatings can also be used in the aviation industry as well as military hangers. Because of its resistance to heat and chemicals, this makes it the perfect floor solution to places that incorporate. Epoxy coatings are also very durable and can last as long as ten years depending on the traffic of a particular area. Epoxy coatings can also be used to cover existing cement flooring and have been used to cover concrete for almost forty years, proving that epoxy has shown itself to be a popular solution (in fact, the epoxy coatings market was estimated at about 800 kilo tons in 2014). If you decide that epoxy coatings are right for you, know that there are steps you can take to speed up the process of applying the coating to your floors. For instance, curing time can be increased by changing the temperature of the room by a mere 18 degrees. Epoxy coatings can provide a flooring solution for many different industries, from the military to the food industry. They are durable and long lasting and have satisfied customers for many years.